Did you know that selecting the correct thermal transfer ribbon can greatly affect your overall label quality? Your print quality and print durability are directly impacted by the type of ribbon that you use on your thermal transfer label printer. Depending on your label stock, you may need wax, wax/resin or resin thermal transfer ribbons. Each of these types of labels will print differently on different label stocks and provide varying levels of durability. Within these three general types of ribbons are specialty ribbons and colored ribbons design to meet certain application requirements like spot color, UV coding or even chemical resistant ribbons. Not only are label requirements cause for choosing a specific ribbon, but the printer being utilized must also be taken into consideration. Different printers, even from the same manufacturer, have different ribbon specifications such as core size, ribbon length, and how the ribbon is wound. 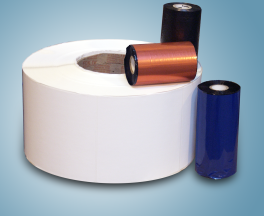 FOX IV offers a wide variety of thermal transfer ribbons in different formulations, sizes and winds for use on almost any thermal transfer printer. Our Media experts can help you decide on the label/ribbon combination that best suits your needs.